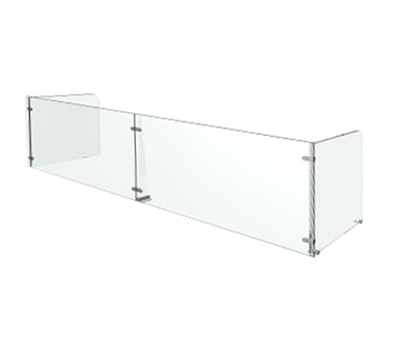 Partitions systems are used for pass-over sneeze guards and as area dividers. They allow the customer to visually inspect the food without providing physical access to the food. Typically a partition separates the food prep area from the customers. Most health dept. want the partition to provide protection from the customers breath area (NSF has the breath area at 54-60" off the floor). We have two different manufacturing styles. The CRY series uses our standard button & strap assembly. This allows us to manufacture significant structures which all interconnect. They can be knocked down, shipped, and reassembled on site. The second method is the CRG assembly. These units are glued together at the factory and are shipped as an assembled unit. This constrains the size of each unit. There are four CRY styles, and four CRG styles. Each product-line has its own individual attributes, but common to all is that the customer does not have direct access to the food. This page shows the CRY series. There are links to the detailed specification for each model below. This partition system has a vertical front shield. 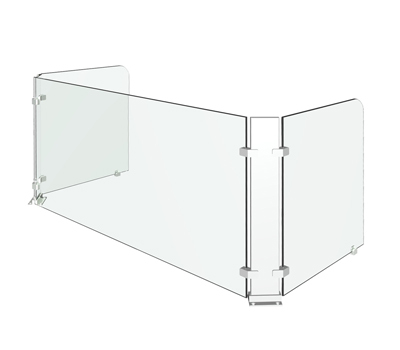 The support post are behind the shield glass, so you have a continuous smooth shield. NSF certified when the correct height and end supports are used. The C102 partitions is similar to the C100 exempt the the front shield is slanted back by 10°. A NSF approved model with the proper height & end supports. The C107 is simple and clean. There are several heights and widths. When installed correctly the C107 meet NSF requirements.